Unfortunately, due to sales rights restrictions, we cannot offer Paradigm for sale in your country. What is tomorrow's Wall Street Journal worth to you today? Where is the line between reality and fiction? Are the financial markets really predictable? Does an ancient artefact hold the key to how some of the world's wealthiest families made their fortunes? When a mysterious granite and cypress Egyptian box is found hidden away in a secret room in the palatial Biltmore Estate, twin scientists Alex and Nicholas Shepard work to unlock the secret of its intricate dials, gauges, crystals, and carvings. What they discover has the potential to make them rich beyond their wildest dreams. But it could also collapse financial markets, bankrupt corporations around the globe, and destroy many of the world's most powerful families. As the twins quickly find out, people will not only kill to make money, but will kill to keep it. What begins as a simple scientific experiment dabbling in the stock market quickly descends into a nightmarish intrigue of murder, deception, and mystery. When one Shepard brother is killed, the surviving twin and his wife find themselves in a desperate gambit to learn the truth about the box's legacy. Using ancient documents found with the box, they unearth clues and trace its history through the ages, from the catacombs of Paris to the Knights of the Templar in Scotland. Their investigation takes them from London to Paris, Venice, and finally, to the Vatican itself, where they uncover the greatest deception ever perpetuated by man. 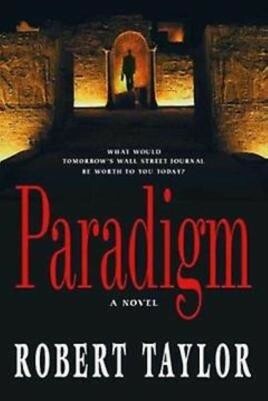 Robert D. Taylor's enthralling novel Paradigm is a unique and masterful blend of intelligent scientific suspense and bold historical mystery stretching from earliest antiquity to the present day and beyond. His intriguing plot and cast of memorable characters makes for a suspenseful page-turner that will keep readers guessing about where the lines of reality and fiction merge. Paradigm demands we believe the unbelievable. And yet the scientific and historical data supporting the"unbelievable" rests right before our eyes. The challenge of finding out just what is truly real and what is not is now up to you.